Lizard roommates are now the least of my unwanted roommate concerns. Last night, I encountered a horrifying… spider roommate. I know what you’re thinking, “Come on, Lara. That’s so lame of you to be scared of a spider,” and yes, normally, I would agree with you. This, however, this was not just any spider. I got back to my room after dinner, and as I stepped into the darkness, I had a feeling that I wasn’t alone and should turn the light on before going much farther. Believe me or not, but I’m telling you, I felt that prickle on the back of my neck, and I listened to it. The instant I switched the light on, I heard a clicking, like the sound of fingernails on a desk, coming from the middle of the floor, and I turned my head just in time to see a blur disappearing under the fridge. Okay, no need to panic… but also no need to get to close to the fridge without seeing if whatever it was would come out on its own first. Ugh just looking at him gives me the creeps. At the time, I thought it would be a good idea to take a picture in case he was missing when Neha and I got back to the room so that she wouldn’t think I had imagined it. I waited maybe 30 seconds before a shape crawled out from underneath the fridge and started scurrying up the wall. A spider. The biggest spider I have EVER seen, aside from maybe at the zoo. Its body was probably at least an inch in diameter, and with its legs it was at least six. Probably more. I’m still the world’s worst estimator. I stared at it, unmoving, and plotted my next move. Doing nothing was not an option because there was a zero percent chance of me going to sleep with that THING in my room. I tried to decide if it was reasonable for me to call for reinforcements. I don’t know what the spiders are like here… maybe people see ones that big all the time. I didn’t want to sound like a child. Also though, I know nothing about spiders. I know that the ones at home are nothing to worry about and won’t kill you, but what if this was a killer spider in my room?! I know that’s dramatic, but like I said, I know nothing about spiders and even less about Indian spiders. Death by spider bite? No, thank you! I finally decided that I would go ask Neha (the girl who helps Ruth with cooking, kids, and cleaning) for help. I ran downstairs, scared the daylights out of her since she’s not used to seeing me again after dinner, and showed her the picture. Her eyes got wide… I guess those spiders aren’t normal around here… and she said, “I will kill it.” She’s much braver than I am. She grabbed a broom and some insect spray, and off we went. Thankfully, when we got back to my room, it had barely moved. As soon as Neha started getting close, it sprinted across the wall until it was right over my bed. That thing moved FAST. She climbed onto the mattress and gave it a big smack with her broom, knocking it off the wall and eliminating at least one leg. But no, it was not dead. 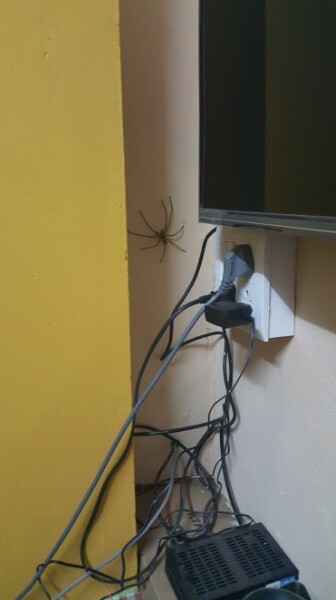 We couldn’t find it, and I started panicking that it was going to run across the floor and onto my foot and up my leg before I could even blink. With that, I did what any sane person would do, and I leapt onto the closest chair. Like I said, Neha is much braver than I am. She started looking for the body, poking around under the bed, pulling off the sheets, moving the mattress… until finally she found it hiding in the corner. Neha, ready to pounce. The spider is just a speck, up in the corner where the orange wall meets the white beam. “He’s very smart,” she said, as she picked up the insect spray. She blasted him with it, and when he ran, she gave him another whack with the broom. Dead, at last. And also leg-less. I still haven’t found any of his legs yet, but if I’m being completely honest, I haven’t looked that hard. 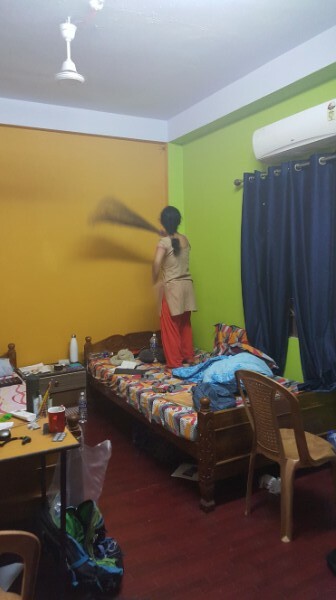 As she swept the body out of the room, a roach flew into the wall and she whacked that too. What the heck is going on in this room? I barely slept last night. I just kept imagining its creepy long legs and the click click click they made as they tapped on the ground. I would rather wake up with a lizard in my mouth than a spider on my face. I was a wreck. Every sound made my heart stop. I slept with the light on. At 3AM, I woke up to go to the bathroom, and I saw a dark shape run across the floor. Another roach. If it was a different night, I might have let it live. Not last night. I smashed it and flushed it down the toilet before going back to bed. In conclusion, I hate spiders, especially ones as big as my face. I have an overactive imagination that is very unhelpful in situations such as these. Neha is an assassin when it comes to insects and arachnids. Still missing: 8 spider legs. I’ve been on high alert all day with no other spider sightings. Hopefully that means I’ll be able to convince myself to sleep tonight. 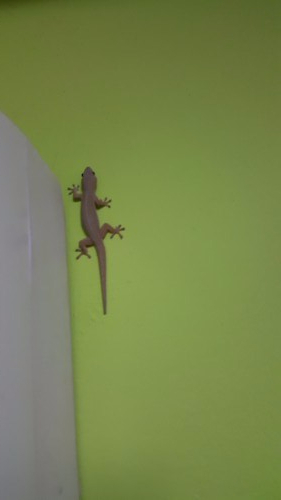 There is a lizard in my room (or maybe it’s a gecko… does anyone know what the difference is? We’ll just go with lizard). Now, I’m not afraid of lizards or anything, but that doesn’t mean I want one in the room where I sleep. I have some lizard-related nightmares that I’d rather not have come true. Nightmare #1: There’s this scene in The Parent Trap (the newer one with MK and Ashley) where the step-girlfriend ends up with a lizard half in, half out of her mouth. I keep having these horrible visions of me waking up in the middle of the night with a LIZARD IN MY MOUTH. Ew ew ew ew ew ew. There he is, lurking right next to my air conditioner like he has no idea what danger lies inside. Nightmare #2: I don’t know if you recall the lizard-meets-A/C incident of 2016, but apparently, I’m scarred from it. Today, my new roommate was hanging out on my wall, my air conditioner was running (which is rare, but it was HOT), and all of a sudden, it decided to move TOWARDS the A/C unit rather than away from it. COME ON, LIZARD! Be smart! It disappeared from view, and I was sure that at any second, a dead lizard was going to be dispensed onto my bed. I’m currently sitting on bed #2, far away from the drop zone. My A/C is now off, and my lizard friend was last spotted heading away from my bed, so I think we’re safe at the moment. Nothing is for certain though. On the bright side, these lizards make this weird sound… I don’t even know how to describe it. My best attempt would be that it’s like when I try to imitate a dolphin. I know, that’s very unhelpful, but it’s the best I can do right now. I’ll start trying to catch it on video. Anyway, that’s a positive in my mind because then you can always tell where they are. I would rather know if my room has been infiltrated, even if it’s going to freak me out a bit. If I’m being honest, the lizard was probably the most eventful part of my day. I’m still sick, so I went to school for 1st period and then came back to sleep. I need to take advantage of all the rest time I can get because tomorrow I have three classes to teach. Jenrika has been with the class 9 English class doing grammar the last couple of days, but I have them back tomorrow, plus the class 8 Science period. Wish me luck! Oh! The other mildly exciting thing that happened today was that it was a kid’s birthday at school, and that means candy! I love how birthdays are celebrated here. This is another “I don’t know if this is an Indian thing or just how things are done at this school” thing. Every day during assembly, they ask if it’s anyone’s birthday. If it is, they come up to the front, and everyone sings “happy birthday” to them (and it’s a much better version than the one we use. I’ve decided that our “happy birthday” song is horrible and kind of sounds like a funeral march. We should work on that). The kid doesn’t have to wear his/her uniform that day, and they walk around the school giving out candy. Tell me that doesn’t sound like the best thing ever! With almost 400 kids in the school, we have A LOT of candy days. This should be a thing everywhere.